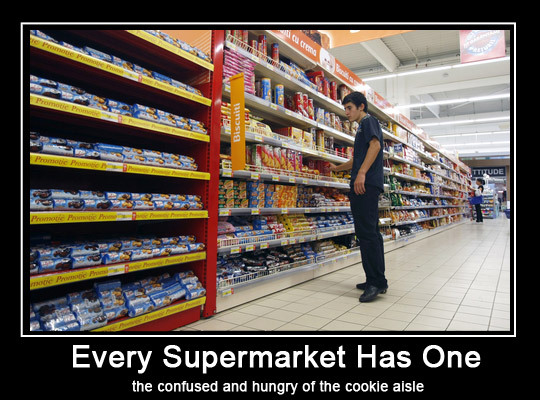 There are 285 varieties of cookies in a Supermarket! Too much choice leads to stress and indecision. Ever find yourself staring at the shelves clueless on what to pick? We worry about what we might miss (opportunity cost), and we struggle to make decisions in the abundance of choice. You can make your audience happy by limiting choices on your website, and have one main choice/goal available on each page/section of your website. Tell them exactly where to go next, and let them know it’s the BEST choice. If you think of each page on your website as having one primary goal then you will be much more effective at engaging your audience. – The results page calls you to click on the result which gives you the best answer, and tells you what Google thinks the best choice for you is. There are other options, but they are hidden away, not too many, and just there if you need them. What can should you do? Think about each piece of content/page/section you produce for your website as having ONE primary goal that you want to get. This doesn’t mean you can’t have smaller secondary aims, but I suggest keeping those to a minimum, and in some cases not having them at all (such as with paid traffic). The secondary aims on your website should not distract from the main goal, and only be there as an option for them AFTER they complete the first goal, or if they DON’T complete the first goal at all. Too much choice leads to inaction. I get what you’re saying, but what about Amazon comparison type pages where you present a comparison of 3 or 4 products? Would it be best to just link out to 1 product or all of them? Comparison sites usually present the best choice (i.e the cheapest) so there is still really only ONE best choice. If the choice is not clear in the type of comparison you make, then you need to define that more clearly. Maybe in such a case the main goal of the page might be to find out what type of person they are, so that you can then present the best choice. This is so obvious yet very few people abide by these rules. I personally prefer simplicity but unfortunately in IM there are so many choices that I too sometimes get swayed to plenty, a storefull of cookie boxes and…the results are obvious. Thanks for reminding me. I’ll return to simplicity. Thanks for the advice. My sites are a bit out of control. Need to get the pages more focused. Just glad I finally figured how to wire it all together. Learning as I go worken with what I got. It is easy to go overboard and add too many things and it just confuses people. This site is a good example of what you are talking about! In a former life I travelled the globe buying Persian, Turkish and Afghani hand knotted rugs. Selling them was always a challenge because my shop was like an Aladdin’s Cave of color. I could always identify the buyers because they would walk in with a sample of curtain material or a cushion they wanted to match in color. But they would often leave empty handed saying, “I like so many of them I cannot make my mind up, let me think about it” Which is the 5 words retailers dread the most. So I mentioned this to a bizarre in Shiraz about this issue who then shared the following piece of wisdom. First listen to what colors the customer is trying to match to, then guide them to 3 rugs and only 3 rugs, which you highly recommend to them. Ask them to point to the one rug which they least like and then remove it from sight, now there is only 2 to choose from, A or B. “This is a very simple choice that anyone can make” , he advised. Of course I tried this method of limiting customers choices and it works 9 times out of 10. The higher the number choices the less likely it is they will make any choice at all. Because in their minds the odds of buyer’s remorse later is far greater. So the Golden Rule is to narrow the choice down to the magic number of 3, then make one less appealing thereby leaving only 2. Which is the ideal number to confidently choose from. Two things happen in the mind of the buyer at this stage, first the odds of 50/50 is something the human psyche can deal with. Secondly, after making a decision they tend to justify and defend that decision to the death, simply to stay consistent. A very good point. As anyone starting off with internet marketing would notice – searching the web you are faced with information overload. When I started years ago I almost threw in the towel. Eventually I picked a few marketers as mentors. Funny enough, they were the ones that were straight to the point, gave me the answers I was looking for and did not overwhelm me with choices, buy this or that. I was looking for the “how to” and jut needed straight to the point answers, not to end up totally confused. Keep it up! On most comparison and review sites the blogger is going to get a commission for whichever product the reader chooses. So the primary action the blogger is looking for is for the reader to click on one of three digital cameras, for example. First, help the customer by narrowing the focus to a specific kind of user. Top Three Cameras for Thrill Seekers, Top Three Family Cameras… You are helping the reader narrow their focus so that they can find the best fit. Helping the reader feel confident that they have the information they need to make the best choice for themselves will fulfill the primary goal of the post: To get the reader to actually click. Of course, you definitely want to tell them to take that one action. What about sites that concentrate on curating information? The Huffington Post etc made a killing in the market by offering a variety of information. So if you’re curating on lots of topics in a particular niche is selling one item enough? Curation sites still have a singular main aim on a per page basis, and that is to get you to read the article. The primary goal on Huffington post for example is to get people to read the article, with the intention that they are then primed for the secondary aim. The secondary aim after that is more page views. To achieve more page views they include sharing, interaction, subscriptions and viewing other content on the site, all of which come after the main aim – to get them to read an article. I have a simple way out of that predicament – skip all that which is processed/reprocessed calling itself food. Those cookies are like the email we receive from so called “manufacturing” marketers. They force you to eat their junk day in – day out. But they forget that people are growing sick of it and making a choice to do something about that which hurts them. Incomes the filters of your systems. The solution is easier than what you would expect. Always go the organic way. After all, you bound to get sick and drop-off sooner or later if you consume manufactured garbage. Organic way is the way of longevity. Organic way equally applied to internet marketing makes more sense. Give me fresh without the additives and genetically modified ingredients and I will read your message!